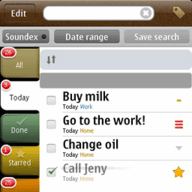 The world's most elegant and hands-on ToDo app was designed to work around your fingers. 2Do surrounds you with your projects and actions, grouped the way you like them, sorted the way you need them and reminding you at the time you want them done. Start 'Getting Things Done' your way. This Premium version supports an unlimited number of calendars as well as alarms and themes support. NOTE: This is a free beta version of a premium paid app that will expire by the end of Dec 2011. Entertainmentby: Guided WaysDescriptionuQuran offers the full Quran in Uthmani Font with an easy to use user interface. It also offers verse by verse translation and *recitation along with bookmarks. uQuran also has 100% Touch Screen support and is the only software of its kind offering full portrait and landscape viewing of the Quran. Utilitiesby: THKDescriptionLaunch your apps with the Circle Launcher. This app helps you to launch quickly and playful your favorite applications.